Wherever you call home, it probably didn't come wired up for that most precious of home utilities: internet access. Sometimes wireless networking can only take you so far. Guerrilla network wiring might sound a little strong, but sometimes it ends up feeling like an episode of MacGyver, without the bombs. (Unless you count flaming laptops.) In today's How-To, we'll show you how to make your own cables and teach you a few tricks for getting them where you need 'em most around the house. 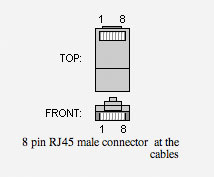 To crimp your own RJ-45, you'll first need understand the pinouts. 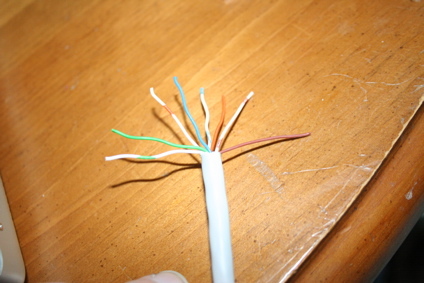 A regular ethernet cable consists of four pairs of twisted wires. 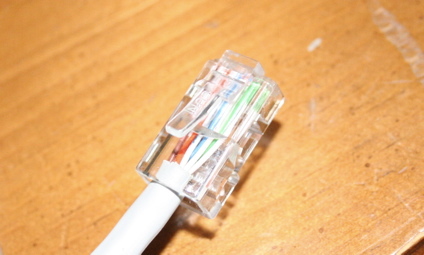 Each pair needs to be connected in the proper order for the network connection to work. 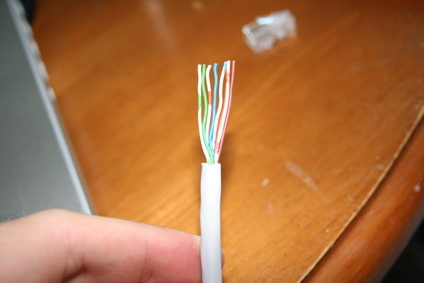 For a normal cable, both ends are connected in the same order. Pinouts.ru is handy, but we've found that color graphics are easier to keep track of. There are a couple of standards for ethernet wiring. They're generally the same, but they like to use different colors. Just make sure you use the same standard for each end of a cable and everything will be fine. 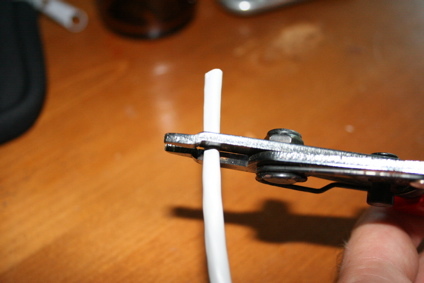 Cut the sheath off of the cable about an inch or so from the end. of the wires. Be careful not to nick the wires in the process. You don't need to strip any of the wires. 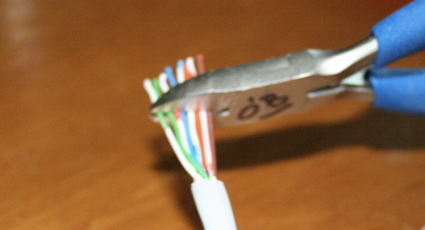 Just spread the wires apart, un-twist them down to the sheath and put them in the order they'll go in the the connector. Straighten each of the wires and pull them together so they're flat and in the right order. Slide them into the plug until the ends of the wires are touching the far end of the connector. 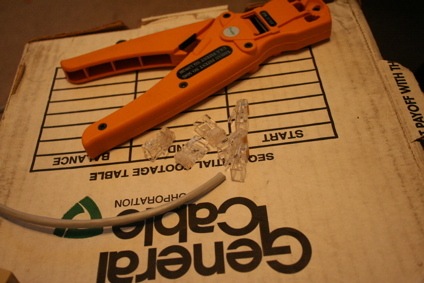 You might want to compare the end to a pre-made cable to double check everything before crimping. 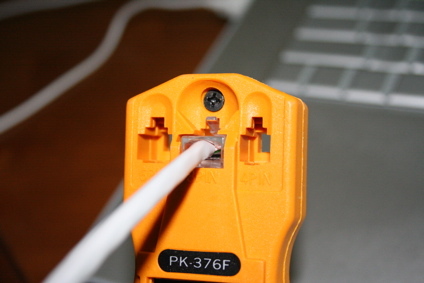 Now that you can make your own cables, it's far easier to run Cat 5 anywhere you want it. 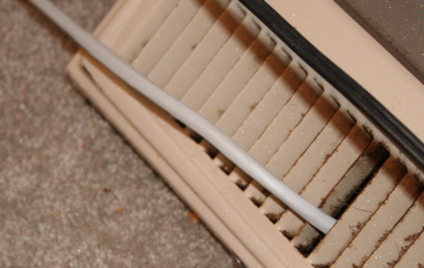 One of our favorite tricks is to run cables through the A/C vents. 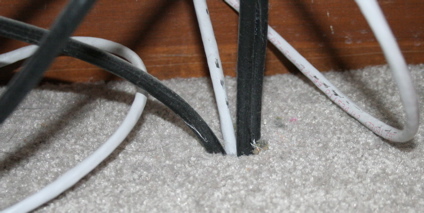 Unfinished basements are fantastic for running wires. Here we've slipped it in between the actual duct and the hole it runs through. Up top, we ran the wire through one of the slits in the air vent. When we move out, we'll just cut the end off the wire and remove it. To get our TiVo networked, we took advantage of the pre-existing monster hole in the floor. 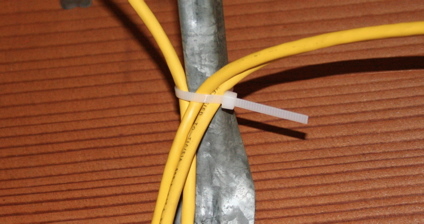 For easy removal and wiring containment, a few zip ties go a long way. That's all there is to it. Don't be afraid to get out your drill, but there's usually an easier to run your network wiring. It's often noted that one should use plenum rated cable for runs through air conditioning ducts. We've found that basic Cat 5 is pretty tough stuff. (We had a piece strung between two houses for over a year and never had a problem with the network connection.) You can probably get away with non rated Cat-5 for short term use, but you probably know as well as we that one gets what one pays for -- so use the good stuff, and go nuts!